…because, as we’ve discussed before, I’m not the brightest crayon in the box, and I may be a few piccolos short of an orchestra. Really, though, I need quick blog posts to get through July, when I’m REALLY ACTUALLY SERIOUSLY going to finish this whole editing thing. Feel free to laugh, I’ll wait. You back? OK, then. This is a personal challenge, in which I’ll be revealing things about myself that are sure to not surprise anyone at all, and may only be of interest to no one. And that’s OK! But if you want to read along or join in, I’ll be here. Thanks to Kristen Hope Mazzola for saying “you should do this.” Today seems to be one of those “hey, if it helps me procrastinate, I’m there!” days. Day 1: Introduction and recent photo. Um… hi. *shuffles feet, looks at something over your shoulder* I’m Kate. You knew that already. I was born in February of 1981 in Hamilton, Ontario, at a hospital that now has a name that I can neither pronounce nor remember. I was a shy child, but have since blossomed into a socially awkward adult. WHEW, that was close! 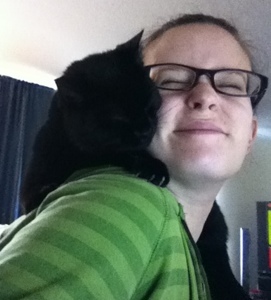 I’m a writer, a blogger, a mom, a wife, a rub-o-matic for several cats and walker for one dog. I’m easily distracted and often can’t seem to focus on anything; I can’t watch a whole movie without having something else to do, and sitting on the floor to play with the kids is pretty much beyond me. My brain almost always has something cooking on the back burner, whether it’s a story or random conversations that result in lovely dialogue that I’ll probably never use. I speak out of turn, I’m not good at cleaning up after myself, and I frequently have the sense of humour of a 12-year-old boy. Writing is often the only thing I can focus on, and even then I need word sprints or something to keep me going for longer than 5 minutes without wandering off to do something else. I’ll read anything but tend to write only speculative fiction. OK, so really all fiction is speculative; you know what I mean. I like magic, I like adventure, I like danger and dragons and having wide, wild worlds to explore, even if those new worlds sometimes look a lot like our own. 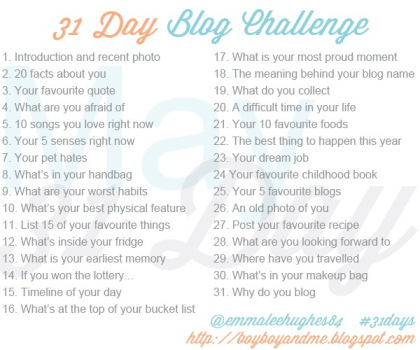 This entry was posted on Monday, July 1st, 2013 at 2:00 pm	and posted in 31 Day Blog Challenge, about me. You can follow any responses to this entry through the RSS 2.0 feed. Awwwwwwwwwwwww! What a great picture. And like Briana said, it’s great learning more about you. I um don’t clean up after myself well either. Sorry Hon….you were born at St. Joseph’s Hospital, which is still St. Jospeh’s Hospital, not the old Henderson, which is now the Juraviniski…but will always be the Henderson to me…that’s where I was born. I loved this by the way!